The girls got their super cute and shiny sandals from Target. These were affordable and I thought they were nice enough for the kiddos to use for other occasions after the wedding. Thanks to my cousin Trisha, Nia’s mommy, for finding these shoes! I had chosen another pair from Target that were not as cute. For their flower girl accessories, they had pearl necklaces and flower crowns. I made the flower crowns with silk flowers from Dollar Tree and Hobby Lobby. Their pearl necklaces were from the Dollar Spot section at Target. I thought they were cute and plastic and perfectly pearly. Lastly, their ginormous silk flowers were from Hobby Lobby. I was going to create crepe paper flowers, but buying these was a way better idea! (This was actually Prentyce’s idea!) The girls were dragging and playing with these during the wedding. The flowers were able to take a beating, so it was nice they were able to play with them and not ruin them. And, to end this post with pure joy and happiness, please watch this video of Nia twirling in her dress. Thanks cousin Trisha for sending this to me and allowing me to post it. These are the other two dress runner-ups. I originally created this graphic back when when Prentyce and I were asking the bridal party for their opinion, but looking at this now, it’s an obvious choice! 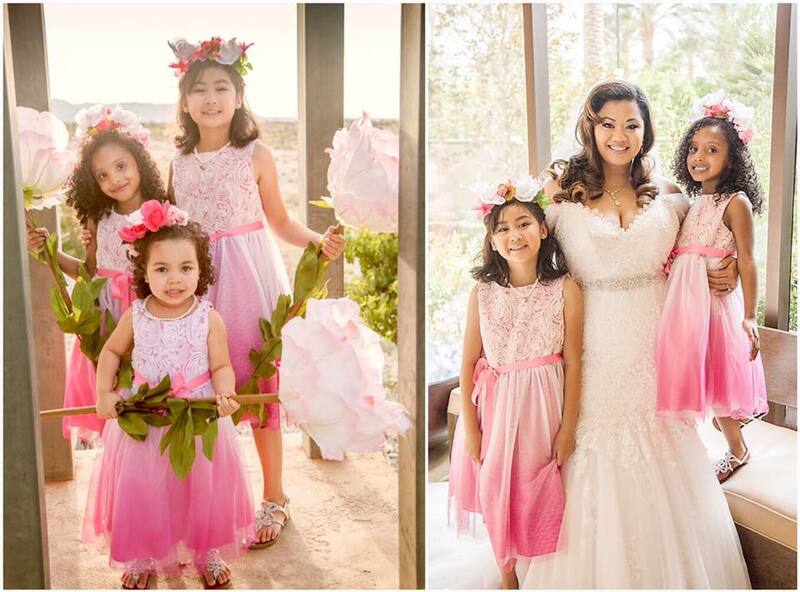 This entry was posted in #TYGHT2015, Wedding and tagged flower girls, pink, tyght, tyght2015, wedding by admin. Bookmark the permalink.